Kait Hurley’s online move + meditate program is my favorite way to workout. I discovered Kait’s program in November 2017 and was hooked. Her high intensity and restorative classes range from 20-50 minutes. And, each class finishes with a meditation. Kait’s method of movement first followed by meditation allowed me to get into a consistent meditation routine. Kait has become a dear friend of mine and we created a week long program that’s available via her App and her website! I chose 3 of my favorite workout classes and paired each with a delicious and nutritious recipe. You can sign up for a FREE 14 day trial of Kait’s App & Website here. You’ll gain access to all her classes and my program (and there’s no risk- you can cancel at any time)! The first workout I chose for the program is Kait's Get After It workout. This high intensity workout gets your energy up and sets you up for a high vibe and productive week. 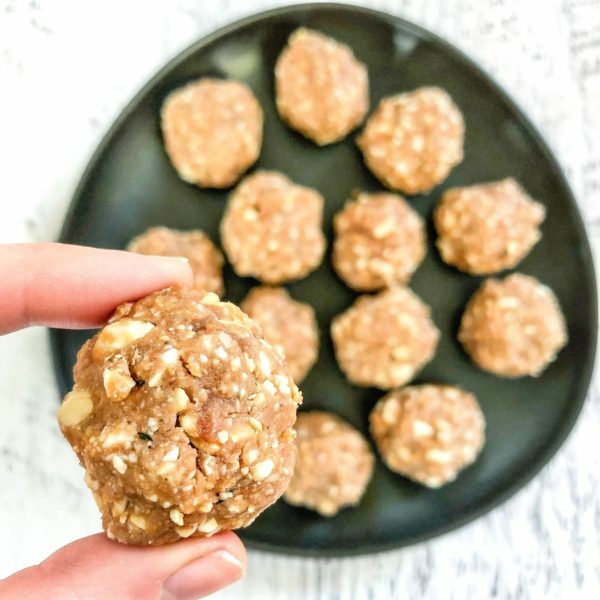 After this workout, take extra care to stay hydrated and munch on these Cashew Peanut Butter Cookie Bites. This recipe is high in plant based protein, complex carbohydrates and healthy fats- the perfect way to recover post workout. (And, all ingredients can be purchased from the bulk section, so the recipe is zero waste!). Enjoy!! Add all ingredients into a NutraMilk or high speed blender/food processor. Blend until a large ball forms, about 1-2 minutes. Using your hands, roll the mixture into about 20 balls (about 1-2 tbsp of mixture per ball). Enjoy after Kait's Get After It workout (or any other workout) or as a nutrient dense snack. Store in the refrigerator in an airtight glass container.